The Long Civil Rights Movement initiative is a project intended to better understand how the South has been shaped by the black and women’s liberation movements, the Vietnam War, natural disasters, and conservative politics. Our team of researchers has conducted oral history interviews in Charleston, SC, and Charlotte, NC. Our focus is on the continued resonance of the civil rights movement after the 1960s. We have conducted over 350 interviews, many of which are available online. Take a look. In most southern communities, school desegregation did not reach significant levels until more than 15 years after the 1954 Brown vs. Board of Education decision. These interviews consider how the process of school integration–and more recent trends toward resegregation–have transformed southern communities. We traveled to Louisville, Memphis, Charlotte, Birmingham, and Robeson County, NC and talked with attorneys who argued integration in court, activists who pushed for desegregation, teachers, students, and school administrators, those who supported and opposed busing, and those watching their schools re-segregate. Historians have already begun to put this collection to good use. 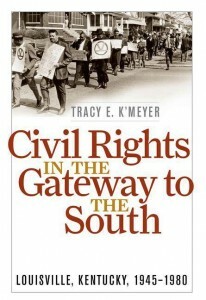 Tracy K’Meyer, who conducted some of our interviews in Louisville, published Civil Rights in the Gateway to the South, the first-ever study of the long-term, interconnected struggles for civil rights in Louisville. In response to Louisville’s unique blend of racial problems, activists employed northern models of voter mobilization and lobbying, as well as methods of civil disobedience usually seen in the South. They crossed traditional barriers between the movements for racial and economic justice to unite in common action. Borrowing tactics from their neighbors to the north and south, Louisville citizens merged their concerns and consolidated their efforts to increase justice and fairness in their border city. By examining this unique convergence of activist methods, Civil Rights in the Gateway to the South provides a better understanding of the circumstances that unified the movement across regional boundaries. Many of the interviews we did for this project are online. Listen and read along here. Even as the popular media in the 1970s and 1980s hailed the South as the nation’s new hotspot of growth and opportunity, a broad range of activists drew attention to the limits of Sunbelt prosperity. This series captures the voices of those men and women by examining movements for affordable housing, residential integration, equal employment opportunity, labor organization, welfare rights, and environmental justice. An additional series of economic justice themed-interviews looks at those who mobilized in the wake of Hurricane Katrina and confronted anew the region’s enduring inequalities. Books that draw on this collection include To Right These Wrongs, a book by Duke professor Robert Korstad and Carolina professor James Leloudis. 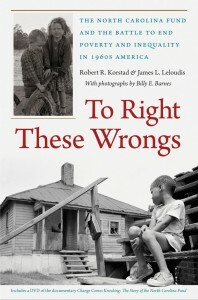 To Right These Wrongs is a history of the North Carolina Fund, a forerunner to the War on Poverty. Korstad and Leloudis show that Fund’s initial successes grew out of its reliance on private philanthropy and federal dollars and its commitment to the democratic mobilization of the poor. Both were calculated tactics designed to outflank conservative state lawmakers and entrenched local interests that nourished Jim Crow, perpetuated one-party politics, and protected an economy built on cheap labor. By late 1968, when the Fund closed its doors, a resurgent politics of race had gained the advantage, led by a Republican Party that had reorganized itself around opposition to civil rights and aid to the poor. The South played critical, if contradictory, roles in shaping the women’s movement and the gay liberation movement. It was during the South’s black freedom movement of the 1960s that many second-wave feminists and gay rights activists first gained experience as grassroots organizers and extended the goals of freedom and equality to questions of gender and sexuality. Yet the South also earned a national reputation for its organized resistance to the Equal Rights Amendment and gay rights initiatives. These interviews look at second-wave feminism and gay rights activism in the South and how both movements were inflected by issues of race and class. Our interest in the long civil rights movement led us to partner with UNC Press and the UNC Libraries, and the Center for Civil Rights on a grant project funded by the Andrew W. Mellon Foundation. The result was “Publishing the Long Civil Rights Movement,” a collaboration intended to explore new ways of scholarly publication, and a national conference, “The Long Civil Rights Movement: Histories, Politics, Memories,” which took place from April 2 to 4, 2009.